Welcome to the Webcam Darts Association! The WDA are the original innovators of webcam darts with nearly 6 years of experience in this field. The WDA offers you the complete webcam darts experience absolutely free. All you require is your dartboard, darts and a webcam with a microphone. The WDA will provide the rest. Playing a real game of darts against anyone in the world has never been easier and more accessible than it is right now. Our simple sign up process and huge community will have you playing a real game of darts against players from all around the world within minutes. The WDA offer competitive league play, site ranking system, handicapping system and weekend and weekday tournaments along with as many friendly games as you can handle! All your game statistics are saved within our database and are easily accessible. With around 1,000 active members there is always a game to be played at any time day or night. At the WDA you can also stream or view matches whilst they happen in real time. The WDA has a huge community feel and we would love you to get involved. Along with all the live darts flying around the WDA also offers much more. 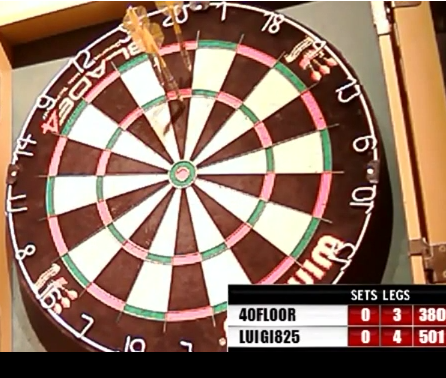 The WDA acts as a social networking portal for darts players. Our chat lobby is the most active darts lobby in the world! When you are not playing darts yourself there is always plenty of lobby activity to keep you highly entertained! Our members and team are always on hand should you require any assistance getting started. From everyone at WDA we wish you an enjoyable stay and we look forward to seeing your darts improve!